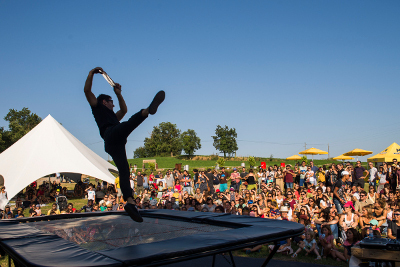 Planeta Trampolí is a contemporany circus company created by Àngel of Miguel in 2017. 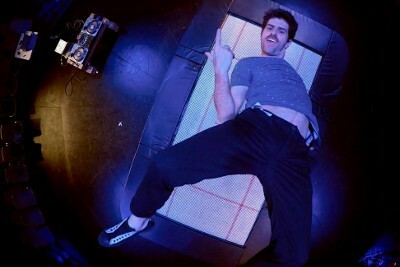 Its vocation is to build an artistic language around the trampoline tthat connects the contemporary circus with all kind of public. His first creation, “Back 2 Classics”, is the first proposal as the result of this research. Àngel studied at the Escola de Circ Rogelio Rivel (Barcelona), at the Centre National des Arts de Cirque (France) in the specialty of trampoline, and perfected his acrobatic technique at the Centre d’Alt Rendiment Esportiu de Sant Cugat. He was co-founder of the company BotProject and created, together with Lucas Ruiz, the show “Collage” that has turned around Europe with more than 350 performances. He has participated in several creations with different companies throughout Europe, and for more 10 year is teacher of elastic bed a the Associació de Circ Rogelio Rivel, Ateneu Popular de 9Barris and the Associació de Circ Cronopis. Planeta Trampolí proposes a fresh, warm and intimate trampoline show for the whole family where the most classic circus fuses with urban cultures through dance, music and Turntablism (scratch with vinyl). The trampoline becomes alive between the follies and acrobatics of its protagonist. A most endearing trip to the past, full of humor, poetry, rhythm and somersaults that will change the concept we have of the trampoline.